If all goes according to plan, my Run Across Oregon should complete on Sunday, Aug 11, 2013 with a 14 mile Fun Run from Dufur to the Washington border. 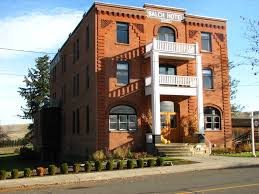 At this point, the plan will be to leave the delightful Balch Hotel in Dufur at 9:00 AM arriving at the border sometime before noon, take a few pictures then head back (drive!) to Dufur for lunch. If you are interested in participating in the Fun Run let me know. If you need any further enticement, that weekend is also the Dufur Threshing Bee!